GMC is pursuing the luxury market with new upscale editions of its 2019 GMC Terrain and 2019 GMC Acadia. GMC says it is responding to customers’ demands for more vehicle personalization. GMC is typically the premium brand compared to the Chevrolet models and new editions known as the “Black” level trim kicks the designation up a notch. The Black Editions include darkened exterior treatments, adding more choices to lineups that also include color-matched, chromed and unique Denali appearances. According to GMC, one in five new SUV buyers spends additional money to personalize their new vehicle’s appearance. Black Editions answer the specific desire for a blacked-out effect and come direct from the factory already specialized. GMC follows other brands, like Ram and Nissan, that offer special, “Night”, “Midnight” and “Black” editions, providing the blacked-out effect straight from the factory. GMC is hoping the new editions will continue the brand’s growth. In 2018, GMC saw its best sales in 12 years, thanks to the surge in demand for SUVs and crossovers. GMC crossovers were up 19 percent in February alone, with the Terrain posting a 17 percent year-over-year increase, and the Acadia was up 22 percent. The Black trim package includes dark grilles, mirror caps and roof rails, as well as special badging. They also will have special wheels. 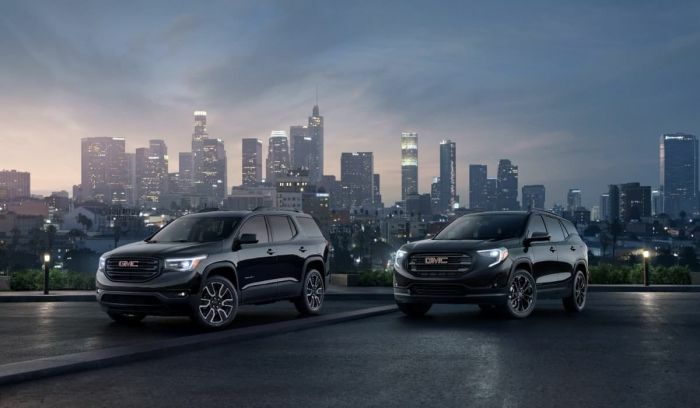 The 2019 GMC Terrain and 2019 GMC Acadia Black Editions will be available this summer. The new Black Edition will be different from the Denali premium trim package. GMC is announcing the new Black premium editions just before the New York auto show. Several automakers are expected to unveil SUV and crossovers as customers continue to demand the larger vehicles.